The death toll from flooding and landslides in Khao Phanom District, Krabi, has risen to five, according to reports from the area, with one more person dead in the Krabi Town area. Landslide at Na Khao Sub-district, Krabi Province. Krabi Provincial Office of Disaster Prevention and Mitigation (ODPM) today reported the flooding and landslide situation in Krabi province to the Ministry of Interior (MOI), with the latest report at 1 pm today announcing that a total of five people had died in the landslides in Khao Phanom district, one yesterday (March 29) and four more today (March 30). Many parts of the district have been affected by flooding and landslides. High water levels have been reported in Khao Phanom Municipality, Tambon Khok Harn and in the area around the Khao Phanom District Office. The ODPM report said that rescue teams from both the private sector and the government were having difficulty accessing affecting areas because of the continued flooding and the presence of debris and obstacles. Approximately 200 villagers have already been evacuated from affected areas to the Baan Huay Kaew school rescue shelter. Other areas in Krabi province are also experiencing flooding, with many roads being cut by the rising waters. A landslide was reported at the road in front of the Tubkaak Krabi Resort and Sofitel Krabi Pokeethra in Nong Talay sub-district, but the road has now been cleared of debris, the ODPM report said. A motorcyclist was also reported dead after he was swept away by fast flowing waters in the Tubpik sub-district of Muang district. 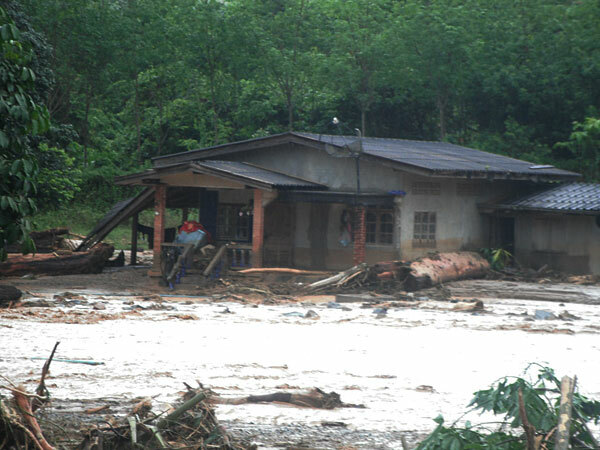 This brings the total reported deaths in Krabi province to six, while more than 210,000 people across Krabi’s eight districts have been affected by flooding and landslides so far. Surrounding provinces, including Phuket, are sending assistance to Krabi.